Music that touches the soul! The passion of the musicians and the spirit of the music is truly electrifying. Just try sitting still while they are playing! Our band joins together to play both traditional and contemporary African songs on marimba, mbira, drums and voices. Teenagers and adults join together to play this joyful music. KUUNGANA itself is a Swahili word that means to connect or join. This lively, danceable music will get your feet tapping and your hips swaying in time to the complex, enticing rhythms. Listeners often call this “happy music” and people of all ages respond to it with enthusiasm and delight. We in the band play this amazing music for the joy it brings to us and to the audience. The lead marimba carries the musical storyline, the other marimbas carry the melodic patterns that weave through the song, and the traditional “hosho”, or gourd rattles, hold the driving beat. It all comes together in a tapestry of music guaranteed to get you out of your seat and onto the dance floor. 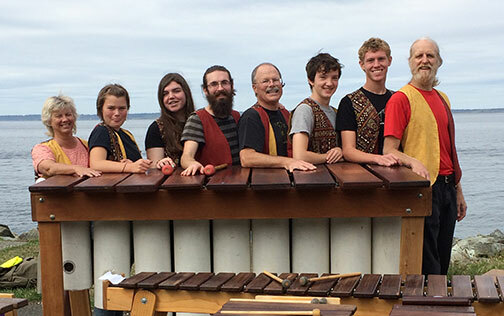 Fairhaven Outdoor Cinema (before the movie "Wonder Woman"
Our band started with three veterans of the now retired Juba Marimba – Bellingham’s premier marimba band (Deb, John and Tedd) and three veterans of Bellingham’s youth marimba band, The Big Bad Monkeys (Adrienne, Maya and Mo). 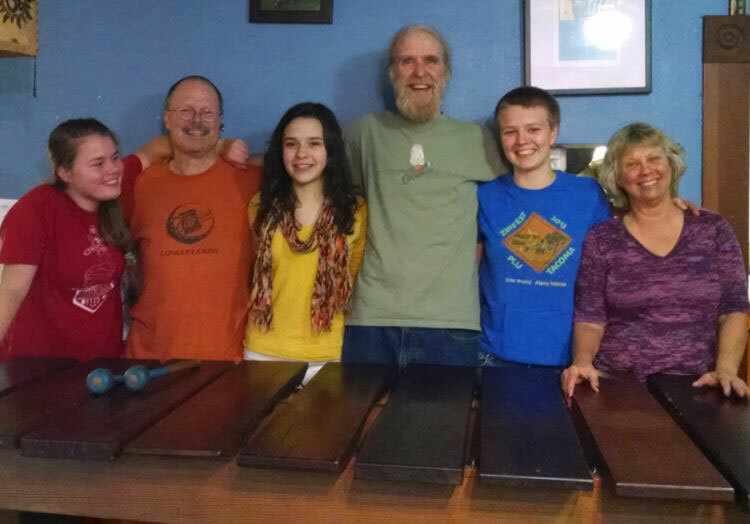 The original youth have gone off to new adventures and our new younger members are Aja, a veteran of Kuva Rhythm Project, Rachel, a Bellingham youth marimba band veteran, and our newest member, Joe, from Seattle’s marimba band Nyamuziwa. Other past members of Kuungana are, Sam, Shea and Jesse. We happily share our music through performances, parties, gatherings, fairs, benefits and school workshops. ENJOY! For booking or other questions, contact us or call Deb 360.739.6801 or John Hatten at 360.671.7012.